When you think of Frankfort, Indiana, what comes to mind? Okay, I’ll admit, it’s not hot dogs. I usually think of Frankfort, Germany, and then I have to remind myself where Frankfort, Indiana is (in Clinton County, east of I-65, on SR 28). But, the town fathers and mothers want you to think of hot dogs, which is why they’re pleased to host visitors and residents to the 16th Annual Frankfort Hot Dog Festival on July 30 and 31. The festival opens at 11 am on Friday, July 30th, and has something going on every hour, until 9:00 pm. The activity picks up at 8:00 the next morning with a 5K Bun Run and Run/Walk (or in my case, Run/Collapse/Be Dragged Off), and closes again at 9:00 pm. Friday’s entertainment will include Patsy Cline and Willie Nelson impersonator, and other local entertainers, the Pacers Fan Van, a hot dog Dance Off, a life-sized marionette show, and karaoke. Saturday has more of the same, but also has the Doxie Derby, featuring — what else? — racing weiner dogs (dachsunds), a classic car show, and a classic rock concert. 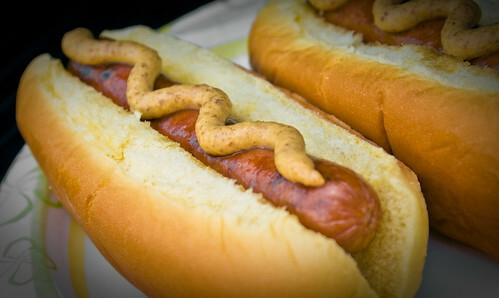 You can find more information about the Frankfort Hot Dog Festival on their website.